In our family, when it comes to birthdays, I usually do my best to make the day special for whichever kid we’re celebrating. The many birthday parties of the last few years have included a Butterfly Tea Party for my daughter, a Star Wars party for my middle son, and a Pokemon-themed party for both my boys. But sometimes…I want a party for me. 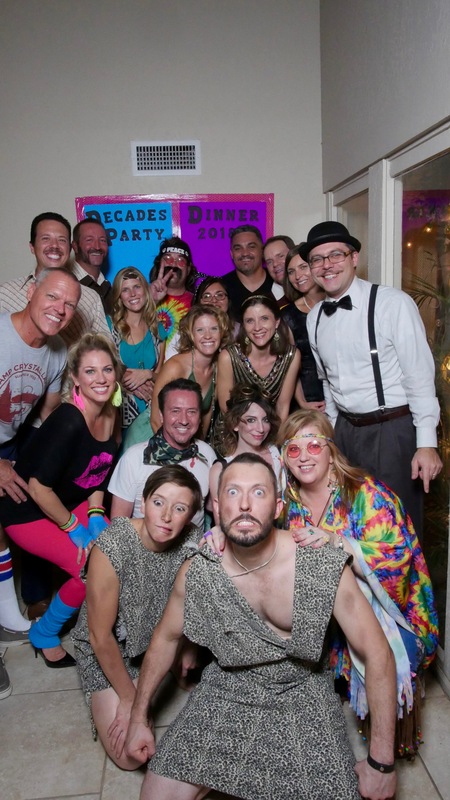 To ring in my 36th year, my husband and I invited a group of fun friends to a Decades Dinner Party. 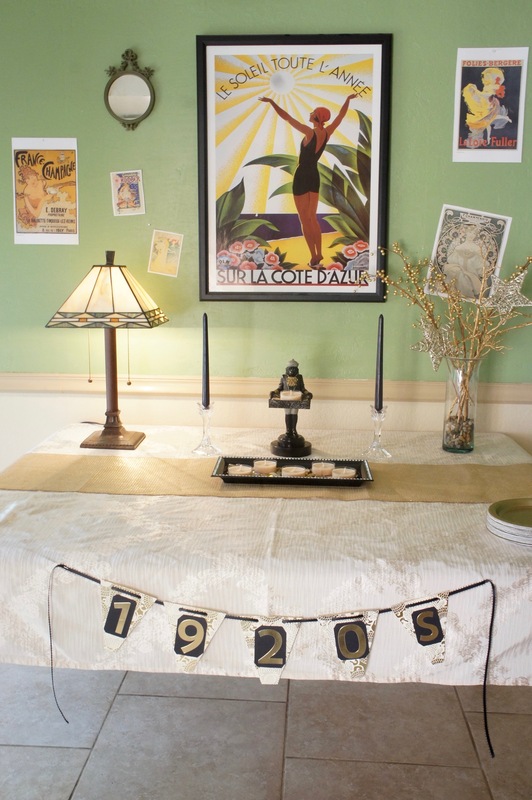 Everyone was asked dress in the theme of a decade of their choice and bring a shareable dish from their era. (We promised to be the 1920s.) 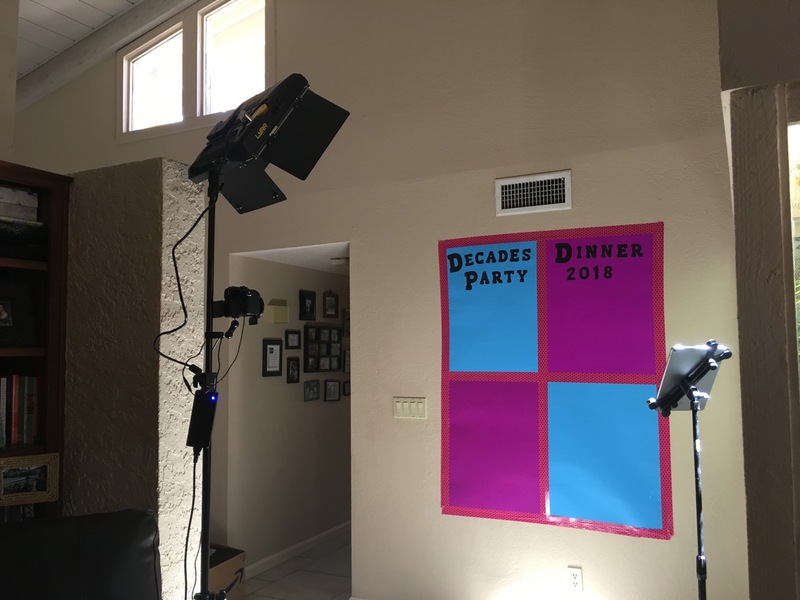 After dinner, we would have an evening of dancing in the backyard studio my husband recently built to house his musical projects. I knew it would be an enjoyable time, but I had no idea just how memorable it would turn out to be! Our friends BROUGHT IT. 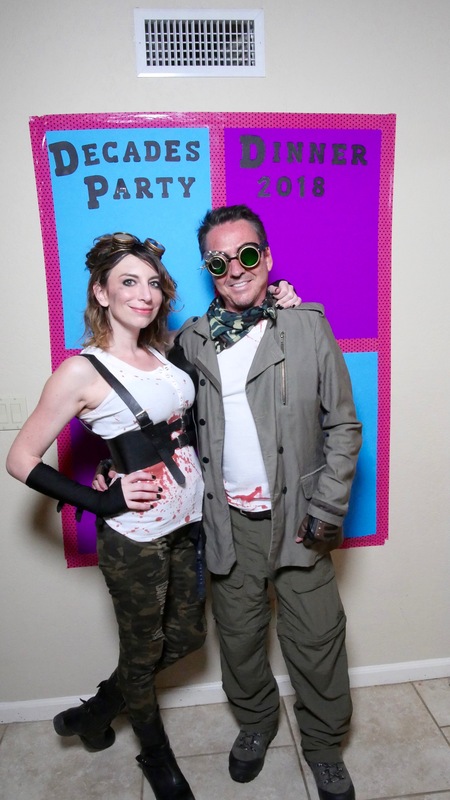 From incredibly creative costumes to spot-on potluck sides, I was thoroughly impressed with their efforts. 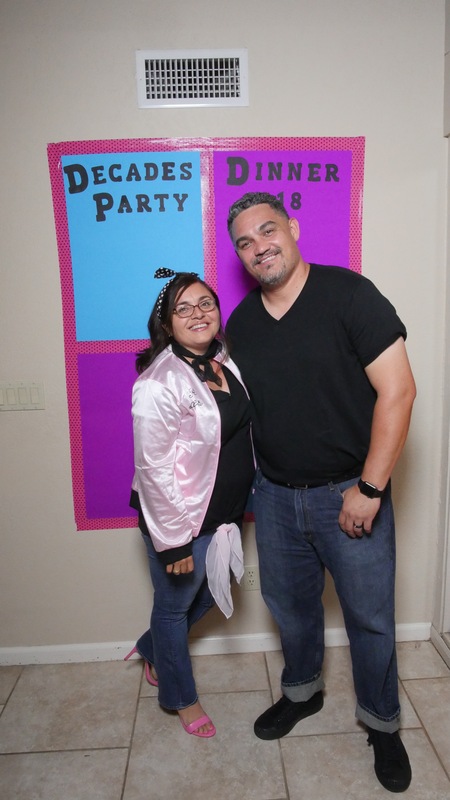 So here’s the lowdown on this themed party, with food and decor suggestions for throwing your own Decades Dinner Party! I don’t know about you, but as much as I love the glitz and glam of the 1920s, I don’t own a whole lot of household items that look like they came from a hundred years ago. I condensed everything I could find around the dessert table in my kitchen dining room. In addition to a Tiffany-style lamp and art nouveau print I happen to have, I went for a gold-and-black theme with table decor, plus some candlesticks. 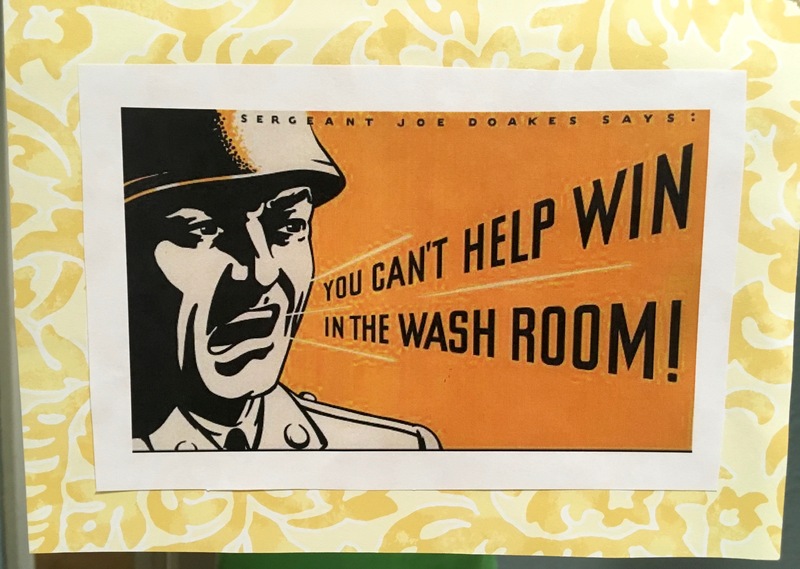 Then I tacked pages of 1920s-era posters torn out of an art book on the wall. Much like my lack of flapper-era materials, I don’t own much (if anything) that screams 1940s. Not to worry, however! 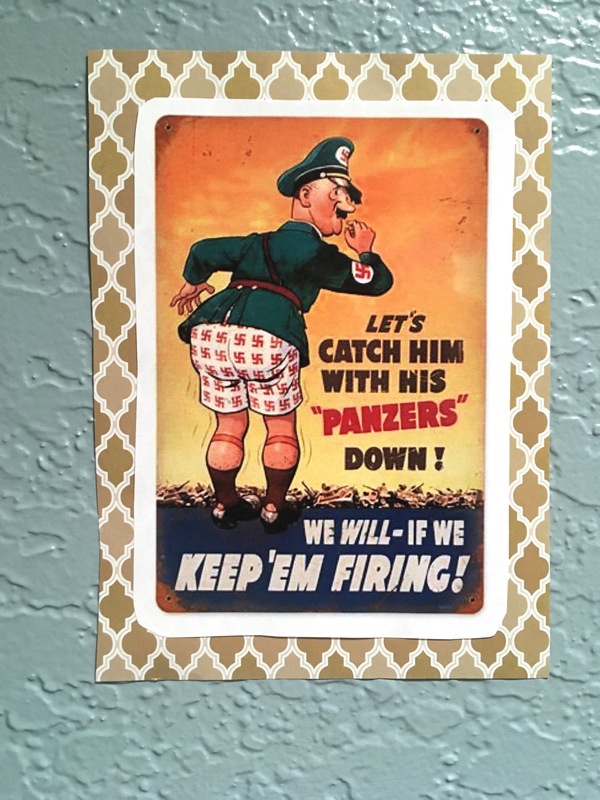 I deemed my bathroom the World War II zone–don’t think too hard about that–by printing off some funny old propaganda posters that seemed bathroom-appropriate. 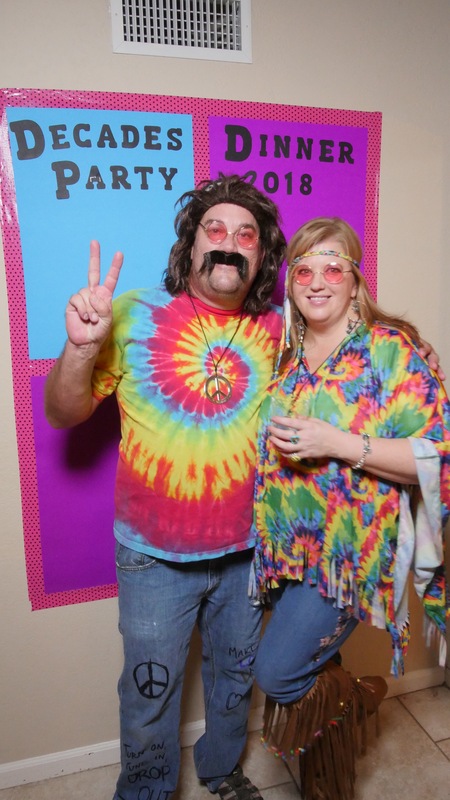 The ’60s were a bit more doable for me, since we still have our trusty Yellow Submarine head-in-the-hole board leftover from our Beatles Singalong Party. (It’s not the kind of thing you let go of too easily.) 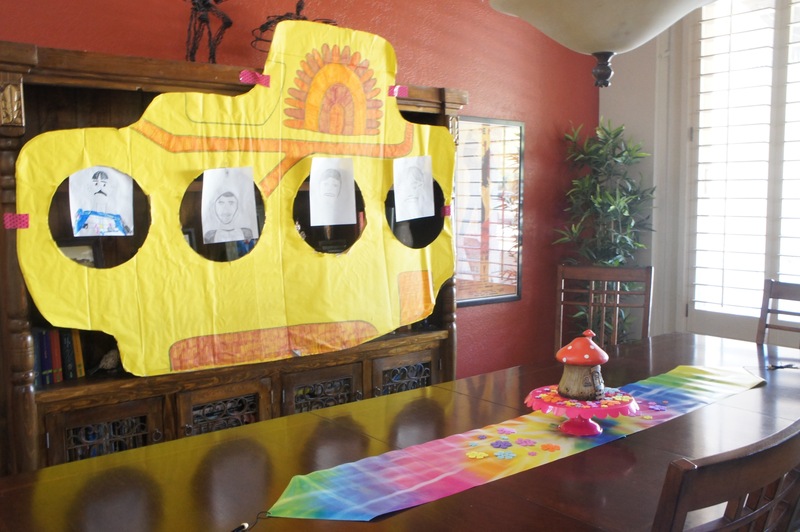 This prop conveniently set the scene, with pictures my kids drew of the Beatles in its windows. From there, a tie-dye table runner seemed only natural. 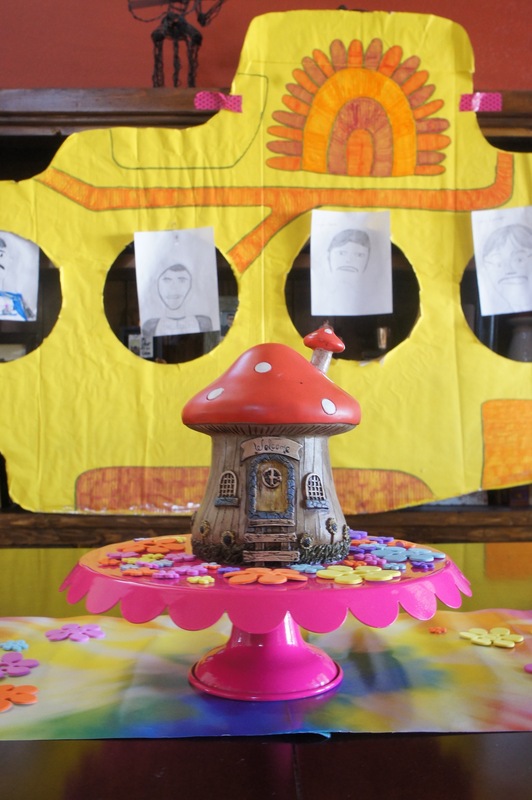 A ’60s centerpiece was a bit more difficult to come up with, but I ended up with this trippy ‘shroom house, a pink cake pedestal, and chunky colorful flower stickers all found at Michael’s. 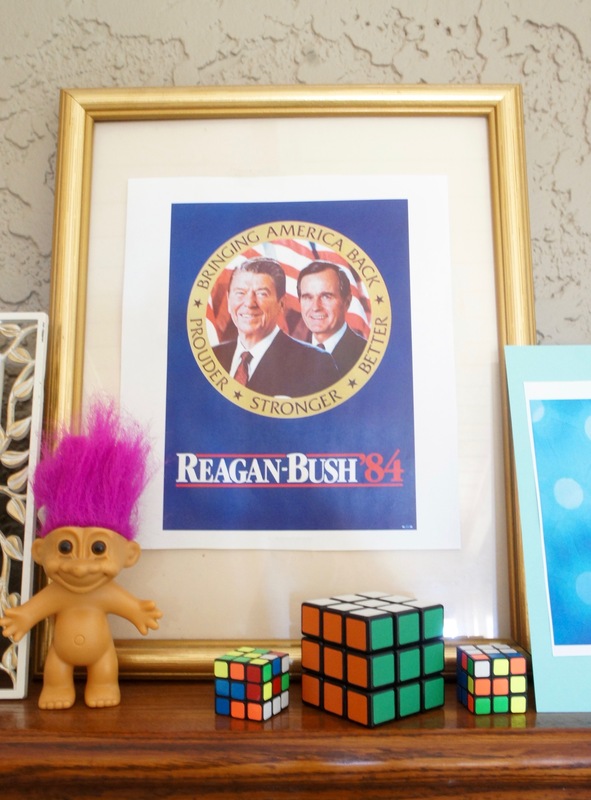 Nothing says ’80s like bits of pop culture like Troll dolls and Rubik’s cubes. 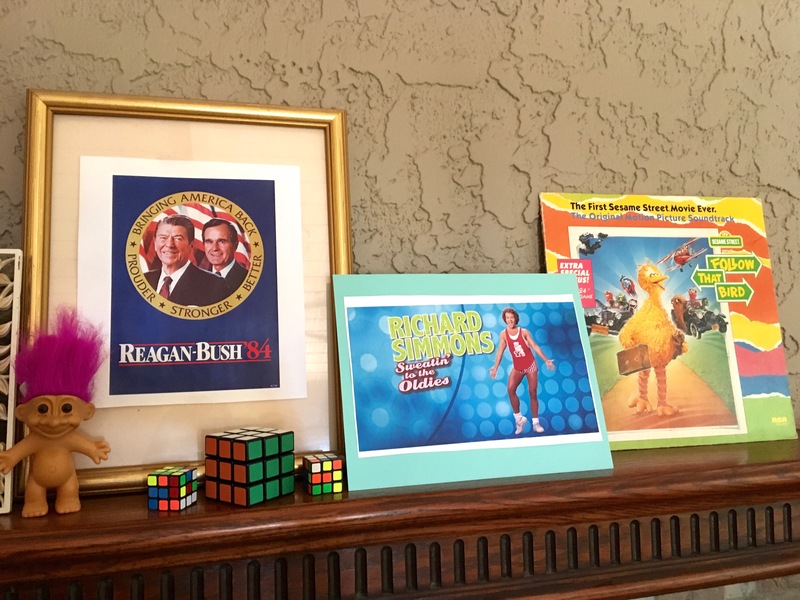 These toys graced the mantle in the family room, along with some throwback posters. 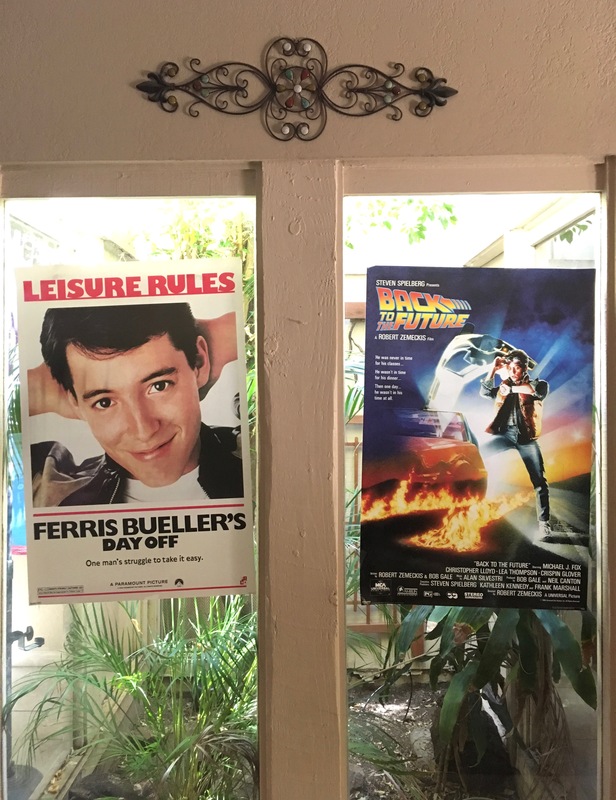 Instant ’80s! Al Capone’s Secret Recipe Pizza–just pizza with a themed name–an easy main dish! Of course, with the theme of the ’20s, we couldn’t do without some bootleg booze. 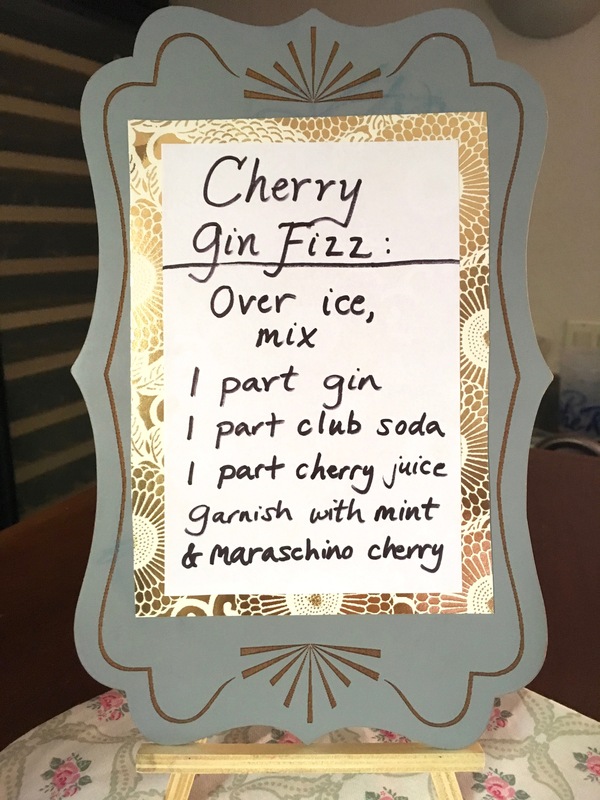 To let everyone make their own gin cocktail, I provided some mixology instructions and a variety of ingredients. Though I was expecting mountains of Jell-O as potluck sides, our friends thought way outside that box, bringing sloppy joes from the ’70s, broccoli salad from the ’80s, and apple pie from the ’50s. 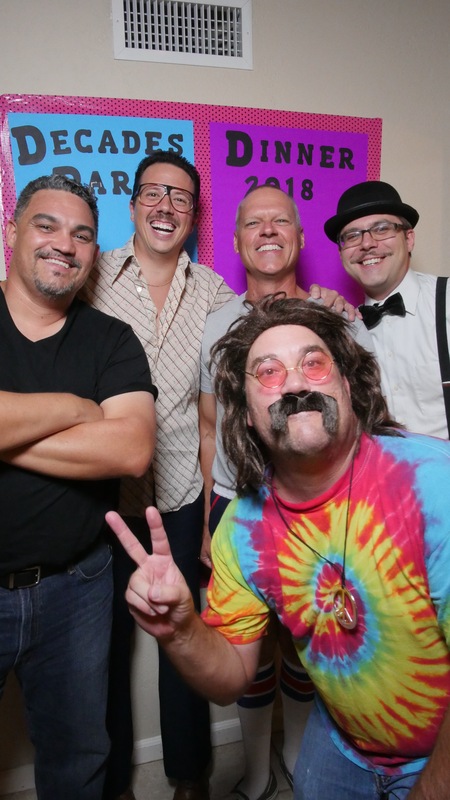 Who doesn’t love a photo booth? 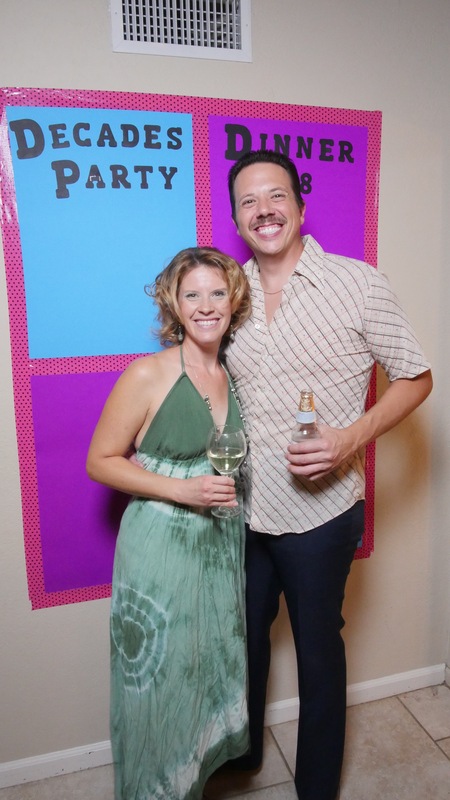 We set up a backdrop and photo station so guests could capture their amazing costumes. And they did not disappoint! Last but not least, group photo! 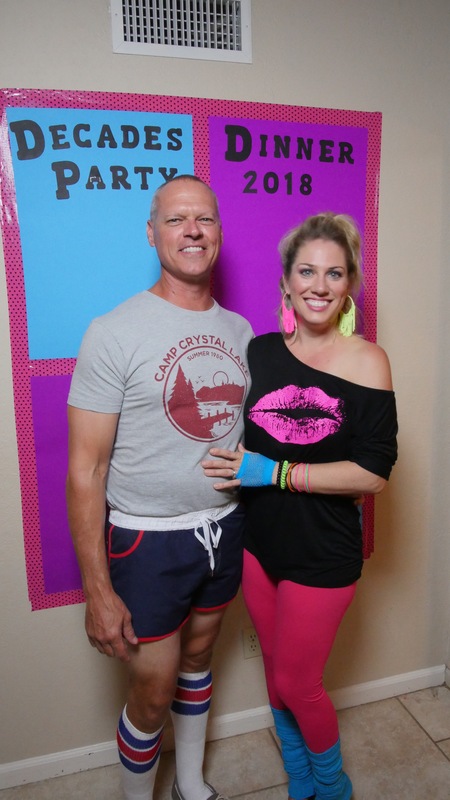 I’d be remiss if I didn’t give a shout-out to the not one but TWO couples who got super creative and showed up from the past (the cave people in front) and the future. What can I say? 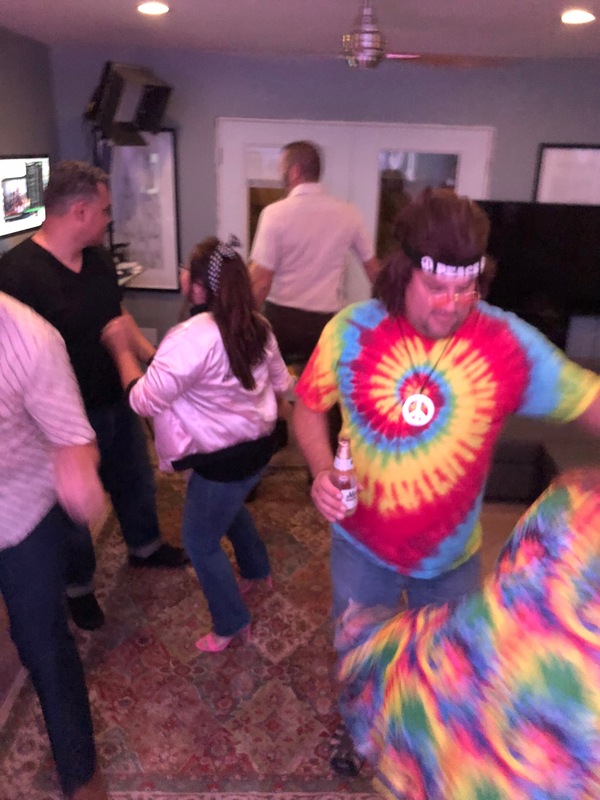 To me, dancing makes a party. 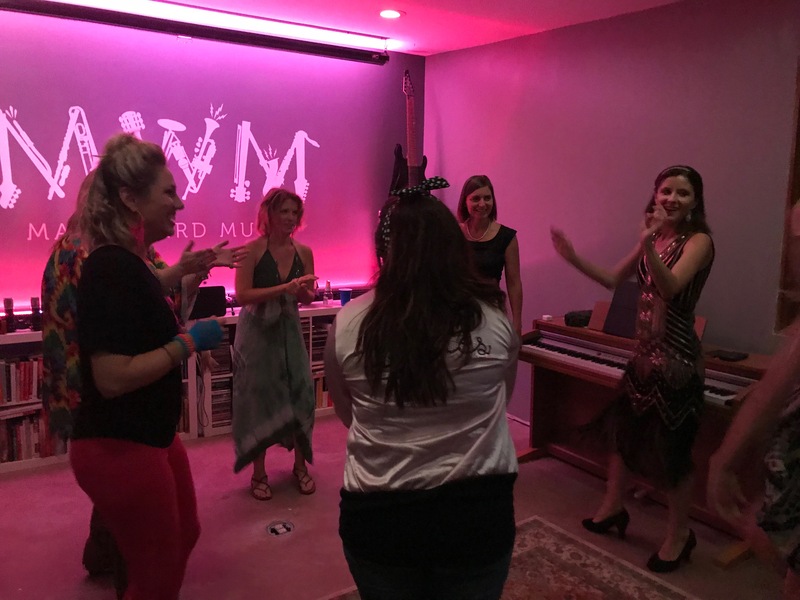 It was so fun to jam out to a playlist of songs from every decade from the 1920s through the ’90s. 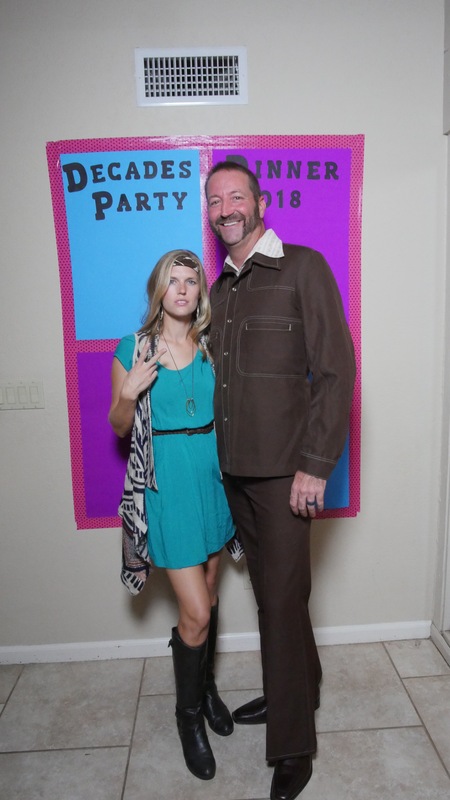 I’d say the blurriness captures the ’60s vibe, amirite? Apparently my dancing is 90% arms. 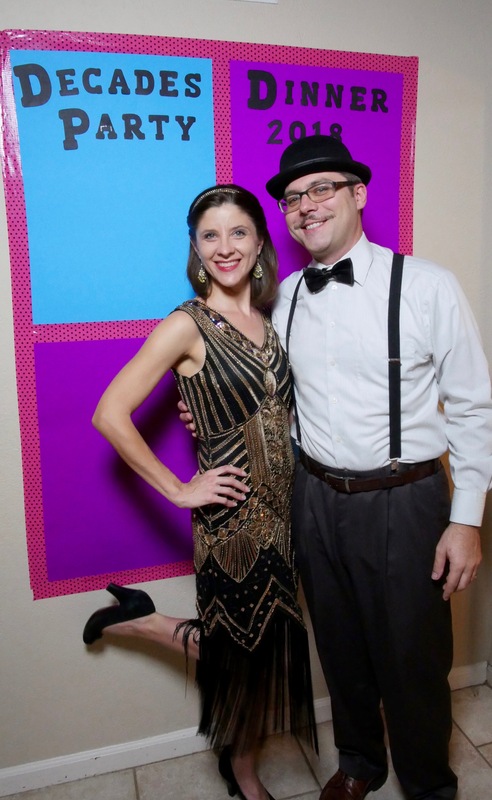 My husband and me working on our 1920s moves. After this party, I really don’t know what I’ll do to top it on my next happy birthday. Thanks again to the dear friends who made it so much fun!